ATTENTION APPLE-ITUNES. THIS PODCAST IS LEGAL. PLEASE LIST ON YOUR ITUNES PODCASTS. ANY QUESTIONS PLEASE EMAIL INFO@BIGUPRADIO.COM. 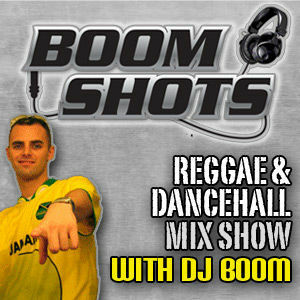 BOOM SHOTS reggae dancehall show hosted by DJ BOOM from Bassmentality Sound. Tune into the Bigupradio.com 24x7 Slamming Dancehall internet radio station every Wednesday 3am 9am 3pm 9pm EST and get the latest reggae dancehall releases mixed by a master. DJ Boom is here to mash up your Wednesdays! Bigup Radio, Inc., operators of the industry-leading BigUp Radio network of Reggae internet radio stations and leading web-site (www.bigupradio.com) for Reggae CDs, DVDs, vinyl, news and reviews, is pleased to announce the milestone 100th Episode of the Boom Shots show on BigUp Radio.